Buying online has become a widespread practice nowadays. People buy everything: starting from clothes and ending with food. Buying gifts is also a very popular practice. However choosing a present is not an easy task either in the physical shops or in the virtual. That's why gift certificates appeared. is a perfect solution which can be purchased through the storefront – it's only necessary to enter information about the recipient before checkout. Then certificate can be sent by email or by postal services. You have the total control of the process though it is automatic. 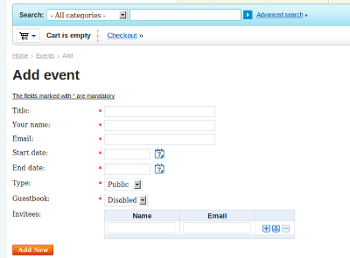 After a gift certificate is purchased, you are able to see all the information in the CS-Cart administration panel. As soon as an email certificate is created, the recipient receives a notification about it sent by system. When the whole amount is spent, the certificate status is changed automatically and becomes disabled. gift certificates do not have expiry dates – so the recipient can use it anytime he likes. CS-Cart Gift Registry Add-on was created to allow people to inform relatives, friends, etc. about what they would like to receive as a present for some special events and holidays. It simplifies the process of choosing the present – as you already know what the recipient wishes. CS-Cart Gift Registry add-on is also very useful for promotion of online gift purchasing. What is especially beneficial is that the process of gift register involves several people and this increases attendance of your webstore. the invitees receive notifications with two links: one of them allows to view all the chosen products, another - to unsubscribe. In order to prevent double purchasing of the same product, system disables the item which was bought so “invitees” will see what is available, what's not.